The Senate is unelected, unaccountable, unrepresentative, secretive, unethical and undemocratic — and a waste of your money. Many senators have their jobs only because they are a friend of, or did favours for, a Prime Minister, and they have their job (with you paying their salary) until age 75 even if they do little or nothing. 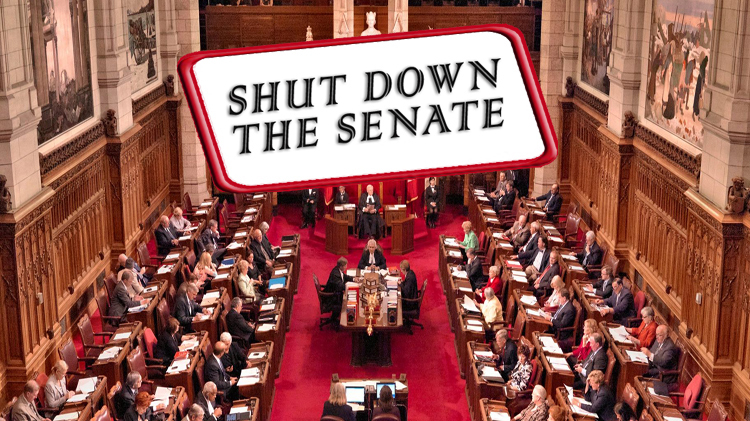 Join with Canadians across the country and send a strong message to key politicians that you want them to stop playing games and immediately take action to shut down the Senate! The recent scandals of senators misspending thousands of dollars of your money, and claiming fraud expenses, have the RCMP and prosecutors considering criminal charges against 3 senators. While those senators fight orders to pay back the money, one of them was bailed out by the Prime Minister’s Chief of Staff, another is still being audited for possible fraud, and a few are also under investigation for not actually living in the province they are supposed to represent. These are likely just the tip of a huge iceberg of Senate scandals that are being covered up by the secretive Senate – a closed club that you have to have money and own property to join, whose members almost always protect each other from disclosure and accountability. Senate ethics rules and enforcement are dangerously weak. Not only is the Senate Ethics Officer under the control of a committee of senators, but also violations of Senate ethics rules can be kept secret and are not penalized in any way, and the rules do not require honesty, and allow senators: to make decisions even if they can profit from their decisions; to accept the gift of unlimited travel, even from lobbyists, and; to sit on the boards of businesses and so they can be essentially inside-government lobbyists for those businesses. There is debate around whether to reform or abolish the Senate and the Supreme Court has recently been asked to rule on whether reforming it requires changes to Canada’s Constitution. The answer is likely “yes” and, as a result, shutting down the Senate is clearly no more difficult than reforming it. The Senate is redundant: The Senate does some good studies, but the Senate has not produced any report that contains anything significantly different than reports produced by privately funded independent think-tanks, NGOs, political parties, House of Commons Committees, the Library of Parliament etc. The Senate is unnecessary: The Senate is supposed to provide balanced regional representation, but that can be achieved by shutting down the Senate and adding seats to the House of Commons from the regions. If you believe in the federation of Canada, representation in the House will never match population exactly (it never has and never will), so there is no real problem with adding seats from the regions to ensure the balance that the Senate is, in part, aimed at achieving. The Senate is illegitimate and will remain inefficient: Currently many senators are in their position for no other reason than they did favours for a prime minister. Electing senators bit by bit over several years, if not decades, will cause a two-tier Senate, and eventually will give the Senate democratic legitimacy which means it will justifiably be able to cause legislative gridlock by blocking bills passed in the House of Commons. The Senate is undemocratic and unaccountable in many other ways: Even if changes are made to have elected senators, or have them serve fixed terms, the Senate will still be undemocratic with a secretive Board of Internal Economy; very weak ethics and expense rules that senators enforce themselves; weak penalties for violators (except sometimes when scandals are revealed); a lapdog Senate Ethics Officer under the control of a committee of senators; a requirement to have money and property to be a senator; and who knows what other problems that the Senate has been covering up, and failing to clean up, for more than 145 years. Please send your letter now calling on politicians to shut down the unaccountable, unethical, undemocratic and wasteful Senate! Please also help keep this campaign running until the Senate is shut down by contributing $10-$20 a month here. Democracy Watch is not funded by the government or businesses — we only accept money from people like you! Send your letter now and help shut down the Senate! I am writing to call on you to take immediate steps to shut down the Senate. Surveys show that Canadians are unhappy with the Senate, and because reform requires an amendment to the Constitution (as the Supreme Court of Canada will soon rule), shutting down the Senate is no more difficult than any other option, and easier and the best and least costly option because of the problems various reforms will cause. The Senate is unelected, unaccountable, unrepresentative, secretive, unethical and undemocratic – and a waste of money. Many senators have their jobs only because they are a friend of, or did favours for, a Prime Minister, and they have their job until age 75 even if they do little or nothing. In these ways alone, the Senate is an embarrassing scandal in a country that calls itself a democracy. The recent scandals of senators misspending money, and claiming fraud expenses, only add to the embarrassment – with the RCMP and prosecutors considering criminal charges against 3 senators while those senators fight orders to pay back the money, another senator is still being audited for possible fraud, and a few senators are also under investigation for not actually living in the province they are supposed to represent. There is debate around whether to reform or abolish the Senate and the Supreme Court has recently been asked to rule on whether reforming it requires a constitutional amendment. The answer is likely “yes” and, as a result, shutting down the Senate is clearly no more difficult than reforming it. Please let me know what you will do to immediately take action to shut down the Senate. I will be deciding which political party to vote for in the next election based on the responses I receive from representatives in each party. I look forward to hearing from you.